The modern day traveler has more options than ever before. In terms of destination, accommodation, modes of transport, attractions, activities, and more, there are long lists of options to choose from to help you make every trip memorable and enjoyable. Accommodation is always a big part of any trip and hostels are one of the most popular forms of accommodation all around the world due to their affordable rates and excellent services. Not only are hostels cheaper than hotels and motels, they also offer more freebies like Wi-Fi access and breakfast buffets, as well as cozy rooms with comfortable beds and communal spaces for travelers to meet and greet one another. Known as Music City, Nashville is the beating heart of the state of Tennessee. The city is most commonly associated with country music, being the home of key locations and institutions like the Country Music Hall of Fame and the Grand Ole Opry, so is a hugely popular destination for anyone interested in country legends, but also has much to offer for other kinds of visitors too. 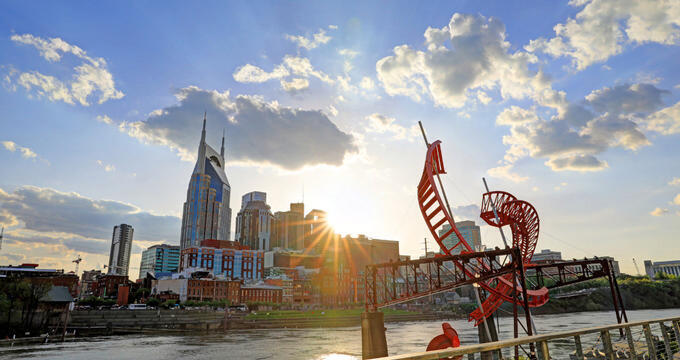 There’s a lot to see and do in Nashville, with the city being well-suited to all kinds of outdoor enjoyment like hiking and kayaking. Like many major American cities, Nashville is also home to a lot of different kinds of accommodation, including a couple of excellent hostels. Staying in a Nashville hostel is a great way to visit the city on a budget. It’s also a smart idea for solo travelers or young people who are interested in sharing their experiences with others. Hostels in Nashville feature lots of communal spaces for you to hang out and get to know new people, potentially making some lifelong friends or simple casual acquaintances along the way. Read on for some key overviews and details on the best hostels in Nashville. If you're a budget-conscious traveler looking for a hostel in Nashville, you probably want to find some accommodation in a good location, with smart transport links to the various landmarks and points of interest around the city, so you don't have to spend too much cash getting around. Music City Hostel definitely fits the bill, being conveniently located within two miles of many of Nashville's top touristic sites like the Ryman Auditorium and Country Music Hall of Fame. This hostel keeps things simple in terms of decor and furnishings, offering highly affordable rooms that are both clean and comfortable. Mixed-gender and female-only dormitories are available in a range of sizes, with comfortable bunk beds for all guests and high speed wireless internet access provided free of charge. You can also reserve private rooms at this location, which are suitable for groups of up to four people and can include private bathrooms if desired. One of the best things about Music City Hostel is all the communal areas it has to offer, including an outdoor space with BBQ and fire pit for campfires and fun meals with friends, as well as a fully equipped kitchen and dining area. Coin-operated laundry facilities can also be found at this location, so it has everything you need to make your stay as enjoyable and stress-free as possible. Right on the banks of the Cumberland River, not far from Cumberland Park and the Nissan Stadium, the Nashville Downtown Hostel is in a really convenient location for the arts district of Nashville and many of the city's top spots like live entertainment venues, good quality restaurants, cafes, bars, historical landmarks, and the famous Ryman Auditorium. Almost everything you could want to see in Nashville is within walking distance of this great location. The hostel itself is housed in a beautiful old warehouse building that dates back to the late 19th century. Room rates are very attractive and there are female, male, and mixed dorms to be chosen from, as well as private rooms with bunk beds and extra furnishings. All rooms and dorms come with clean, shared bathrooms, and all guests are given access codes to enjoy high-speed Wi-Fi during their stay. In terms of communal areas, Nashville Downtown Hostel has a fully equipped kitchen which is great for cooking up pizzas, a music area, a laundry room, a computer space, and a lounge, so there are a lot of nice spaces to spend your down time at this Nashville hostel.